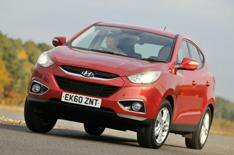 Hyundai ix35 driven | What Car? If the ix35 is all about crossover style and space on a budget, then this new entry-level 1.6-litre petrol version should be a winner. Its certainly got the value part sewn up. For £16,195 (or £16,365 with engine stop-start, as fitted to our test car), you get a practical family car with an economical and impressively punchy engine. True, the engine is a bit boomy at medium revs, but its smooth.The stop-start system is slick, too. The ride isnt quite so polished, with a little too much bump around town and too much fidget on the motorway, but otherwise the ix35 is decent to drive. Light controls and a high-up driving position help make low-speed manoeuvres easy, even if over-the-shoulder visibility isnt so good. Of course, this is a Hyundai, so youd expect plenty of kit. You get it: air-con, heated front and rear seats, reversing sensors, Bluetooth, six airbags and stability control are all standard, plus a five-year, unlimited-mileage warranty. If only the plastics were as plush. Still, at £1200 less than the cheapest diesel model, this petrol ix35 deserves to be considered.